Darrell Dennis in Tales of an Urban Indian. Photo: Native Earth Performing Arts. Currently, TALES OF AN URBAN INDIAN is playing at The Public and, now, the Public LAB Speaker Series, held every Tuesday following Public LAB shows, will consist of conversations with the artists and notable panelists. In addition, NBC Universal, in conjunction with The Public, will be holding Native American Talent Outreach events. A part of The Public Theater’s Native Theater Initiative, TALES OF AN URBAN INDIAN is written and performed by Darrell Dennis (from the Shuswap nation) and directed by Herbie Barnes (from the Ojibway nation), and will run through Sunday, March 15. Tickets are $10 for all performances and include free admission to Tuesday evening post-show discussions. 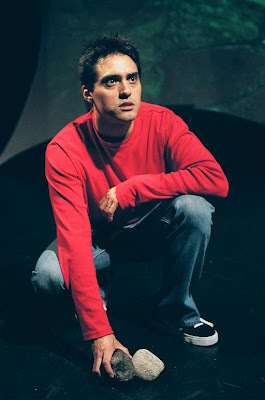 "In TALES OF AN URBAN INDIAN, acclaimed Canadian playwright and performer Darrell Dennis tells the semi-autobiographical tale of a young Indian man, Simon Douglas. From living life on the “Rez” to navigating the mean streets of Vancouver’s east side, Dennis weaves a funny and stirring story of identity, discovery, choice and self-respect. A hit from The Public’s inaugural Native Theater Festival, this one-man play returns to make its U.S. premiere following a Canadian tour and two nominations for the Dora Mavor Award, the highest theatrical honor in Canada. " "The Tuesday, March 3 post-show discussion will focus on “Native Theater in New York City Today.” Panelists for this introduction to New York’s local Native theater scene, moderated by The Public Theater’s Literary Associate Liz Frankel, include Steve Elm of Amerinda, The Smithsonian National Museum of the American Indian’s Heye Center director John Haworth, Spiderwoman Theater’s Muriel Miguel, and Mixed Phoenix Theatre Group’s Danielle Soames." "Following the Tuesday, March 10 performance, Cherokee director Betsy Theobald Richards will join with artists from the formative years of the Native Theater movement to discuss “The Rise of Native Theater in New York City in the 1960s and 70s.” Panelists will include writer and advocate Suzan Shown Harjo, actor and producer Soni Moreno, and Spiderwoman Theater’s Muriel Miguel." In addition to the Public LAB Speaker Series, The Public hosts NBC Universal’s Native American Talent Outreach in conjunction with TALES OF AN URBAN INDIAN. On Monday, March 9 at 6:30 p.m., NBC Networks executives will present a multi-network industry panel discussion of particular interest to Native actors, writers and directors. Tickets are free; to RSVP, please email industrypanel@publictheater.org. On Tuesday, March 10, from 9 a.m. to 1 p.m., NBC Universal will host an open casting call, featuring talent representatives from a variety of film and television projects who are in search of Native American actors for non-specific roles. This open call is designed to increase diversity across NBC Universal’s expanding talent pool. For more information on this event, please visit www.diversecitynbc.com . "The goals of the Native Theater Initiative at The Public Theater, funded by The Ford Foundation, are to support the work of Native theater artists across North America; to create a forum for field discussion among Native theater artists and professionals; and to further raise visibility and awareness of Native theater artists for New York audiences and the greater field of American Theater. " "The Public Theater’s Native Theater Initiative Advisory Committee consists of Sheila Tousey, Hanay Geiogamah, Terry Gomez, Alanis King, Daniel David Moses, Yvette Nolan, Jennifer Podemski, Randy Reinholz, and Edward Wemytewa. " TALES OF AN URBAN INDIAN will run through Sunday, March 15. The performance schedule is Tuesdays through Fridays at 8 PM; Saturdays at 2 PM and 8 PM; and Sundays at 2 PM and 7 PM. The Public Theater is located at 425 Lafayette Street. All tickets are $10 and can be purchased at (212) 967-7555 or by visiting www.publictheater.org . DARRELL DENNIS (Playwright and Performer) is an actor, writer, and comedian from the Shuswap Nation in the interior of British Columbia, Canada. He is a produced playwright and an award-winning writer for television. His script “Moccasin Flats” was accepted into the 2003 Sundance Film Festival. Darrell is a two-time Dora Award nominee for his one man show Tales of an Urban Indian. He is also an alumnus of the Second City National Touring Company. His playwriting credits also include Trickster of Third Avenue East. HERBIE BARNES (Director) works as an actor, director, writer and teacher. His film credits include the television movie “Spirit Rider,” the feature film Dance Me Outside, and the television series “The Rez.” His theatre credits include Toronto at Dreamers Rock, The Rememberer, Boy in the Treehouse, The Illustrated History of the Anishnabe, The Hobbit, The Gap, Sucker Falls, The Epic Period, Sin City, and the Manitoba Theatre for Young's People's production of IMROVident: The Show Where Anything Can Happen. DARRELL DENNIS (Shuswap) is the writer and star of the two-time Dora Award-nominated Tales of an Urban Indian. He is best-known for his roles in such television series as “Northwood” and “The Rez.” His feature film credits include Leaving Normal, Shania: A Life in Eight Albums, and Indian Summer: The Oka Crisis. STEVE ELM (Oneida) is an actor, writer, director and educator who has worked in the New York Native community for many years. He is Artistic Director of New York City based Amerinda Theatre, whose mission is to develop and present Native American theatre artists. SUZAN SHOWN HARJO (Cheyenne & Muscogee) is a poet, writer, curator and policy advocate, who has helped Native Peoples recover more than one million acres of land and has developed key laws to protect Native nations, arts, cultures, languages, religious freedom, sovereignty and sacred places. A Founding Trustee of the National Museum of the American Indian, she began work in 1967 that led to the NMAI, to repatriation laws and to museum reform. JOHN HAWORTH (Cherokee Nation of Oklahoma) is Director of the National Museum of the American Indian’s George Gustav Heye Center in New York City. Mr. Haworth has an MBA from Columbia University, where he also was designated as a Revson Fellow on the Future of New York City in 1979.. He has written extensively on cultural and museum issues over the years, including articles for NMAI exhibition catalogues and magazines. MURIEL MIGUEL (Kuna/Rappahannock) is a founding member and Artistic Director of Spiderwoman Theater, the longest running Native American women’s theater company in North America. Her stage credits include: Philomena Moosetail in The Rez Sister, Aunt Shadie in The Unnatural and Accidental Women, Martha in Buz’Gem Blues, Spirit Woman in BONES: An Aboriginal Dance Opera. She has created the one-woman shows Hot' N' Soft, Trail of the Otter and most recently Red Mother. SONI MORENO (Maya, Apache, and Yaqui Nations) hails from California, studied at the American Conservatory Theatre in San Francisco, where she played the role of Crissy in the original San Francisco Cast of Hair. Aside from her theatre credits, she is the co-founder of the aboriginal women’s vocal group “Ulali,” Associate Producer for Native Roots in Rhythms Music Festival in Albuquerque and is on the Board of Directors for the American Indian Community House. YVETTE NOLAN (Algonquin from Kitiganzibi Nation). Her plays include BLADE, Job’s Wife, Video, Annie Mae’s Movement, the libretto Hilda Blake and the radio play Owen. She is the editor of Beyond the Pale: Dramatic Writing from First Nations Writers and Writers of Colour. Directing credits include Death of a Chief, Tales of An Urban Indian, The Unnatural and Accidental Women, Annie Mae’s Movement (Native Earth), The Only Good Indian..., The Triple Truth (Turtle Gals). She is currently the Artistic Director of Native Earth Performing Arts, and the President of the Indigenous Performing Arts Alliance. RANDY REINHOLZ (Choctaw Nation of Oklahoma) has directed close to 50 plays across the U.S. and Canada. He was the director and executive producer of Urban Tattoo and the critically acclaimed productions of Jump Kiss, The Buz'Gem Blues and Please Do Not Touch the Indians and was the executive producer of the 2005 world premiere of Kino & Teresa. Reinholz has co-sponsored showcases and Native American diversity workshops for ABC and NBC and is an annual guest artist for the FOX American Indian Summer Institute. BETSY THEOBALD RICHARDS (Cherokee Nation of Oklahoma) joined the Ford Foundation’s Knowledge, Creativity and Freedom Program in 2003 as a Program Officer in arts and culture. She also serves as a chairperson of Ford’s worldwide Committee on Indigenous Peoples, is member of the Foundation’s Philanthropy Learning Group and serves as an advisor to Ford’s global Intellectual Property Initiative. Betsy, who has worked as a theater director and dramaturg, developing scripts by Native American writers, is proud to serve as the first Native American Program Officer at the Ford Foundation. DANIELLE SOAMES (Mohawk). An actor, director, producer and now co-founder and artistic co-director of Mixed Phoenix Theatre Group, she has lived in NYC for the past 12 years. She is a contract cultural interpreter at the National Museum of American Indian. She writes a column in Eastern Door Newspaper and writes for Talking Stick, part of AMERINDA, regularly. SHEILA TOUSEY (Menominee and Stockbridge-Munsee Nation) has acted in movies, television and in theater in NYC and regional theaters across the U.S. Some of the directors she has worked with include Joanne Akalaitis, Joe Chaiken, Linda Chapman, Kennetch Charlette, Liviu Ciulei, David Esbjornson, Ron Van Lieu, Hanay Geiogamah (American Indian Dance Theater), Lisa Peterson, Betsy Richards, Sam Shepard, Tony Taccone, Paul Walker and Robert Woodruff. In 2006 Sheila was Artist-in-Residence at the Public Theater; she currently serves as The Public’s Native Theater Initiative Consultant. The Native Theater Initiative Partners are Alliance for Inclusion in the Arts, American Indian Community House, Amerinda, The Hemispheric Institute of Performance and Politics, The National Museum of the American Indian.